Below you will find pictures of new citterns and other historic, wire-strung instruments built by modern makers. The list is arranged alphabetically by maker.Clicking on the thumbnail image of the instrument will take you to a separate page of images for that instrument which may contain additional information. For contact information for individual makers as well as a complete listing of current builders, please see the Makers & Suppliers page. If you have an instrument that you would like to have pictured, or know of anyone who does, please feel free to contact me and we will be more than happy to post it to this page. Unknown Italian(?) Pictures of a cittern sent to me for inclusion in the site back in 2002(?). The original email has since been lost. If you have any further information, please contact me. Ron Banks 1996, USA 4-course cittern modeled after Gasparo de Salo and Praetorius's "Klein Englisch Zitterlein." Large images of the cittern and ceterone side-by-side can be seen here. Bruce Brook 2007, England Chromatic, 4 courses. 49 cm mensur. Peter Forrester 1998, Norwich, England Two Italian carved hexachord citterns. Peter Forrester 1999, Norwich, England Italian cittern after original in Florence (attr. to Nicolo Amati). Peter Forrester Norwich, England Two different citterns modeled after Campi, and an English cittern. Ludwig Friess 2007, Austria Instrument completed for final exam at the Austrian instrument building school in Hallstatt, 2007. Andrew Hartig 2007, California, USA Chromatic, 4 courses. 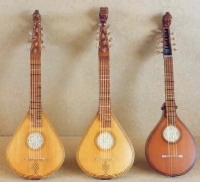 Outline based on the Zuyderzee citterns but modified to have a slightly shorter string length in order to allow more comfortable playing of some of the long left-hand stretches in the English repertoire. Andrew Hartig 2006, California, USA Diatonic, 4 courses. Based on the recovered Zuyderzee citterns (see instrument by Sebastián Núñez). 44 cm mensur. Hans Hermann Herb 1976, Germany This cittern was listed for sale on eBay in February of 2000. Gesina Liedmeier 1993, Netherlands Cittern modeled after Gasparo da Salo. Sebastián Núñez Netherlands "Zuyderzee cittern." Reconstruction of two citterns recovered from a sunken ship. See page for additional photos as well as pictures of the recovered instrument. Edward Rusnak 1998, Montreal, Quebec 4-course (chromatic) based on 6-course (diatonic) cittern by Canpi. Ron Banks 1998, USA 12-14 course ceterone modeled after Campi. Bruce Brook 2007, England 7 course bandora. Christopher Davies 2008, USA 7 course orpharion. Peter Forrester 1999, Norwich, England 6 and 7 course bandoras. Gesina Liedmeier 1994, Netherlands 9 course orpharion. John Lucas c.1991, Sydney, Australia 7 course bandora.